I get this asked these questions all the time what is shakeology? What is in it? what does it do? Shakeology is like protein, meal replacement,antioxidant and probiotic drink…this is the healthiest meal of the day. is made with superfoods found all around the world to give your body the nutrients it needs. It is the most delicious, nutrient-dense shake that’s made with superfoods we should be eating everyday but don’t. It helps increase energy, reduce cravings, and helps you lose weight. I should know because I personally lost 10 pounds after two weeks of replacing my breakfast with this. To be honest with you I did the autoship with the intention of cancelling it after 30 days but I loved what it did for me so much that I just kept going. I don’t feel hungry like I did other shakes I have tried on the market. 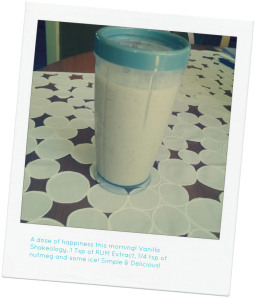 My Vanilla Shakeology blend…Shakeology comes with a recipe book which makes it even more delicous. Adaptogen Herbs: Helps increase stamina and energy (Great for Beachbody work outs or running or keeping up with your kids!) It also helps counter depression an example of a Adaptogen herb is Gingseng! Sacha Inchi: Full of omega 3 fatty oils, Sachi Inchi is a plant that grows in the highlands of peru beccause of it’s nutty flavor it is considered a tastier option than fish oil. Easier to digest it aids in lowering cholesteral, help maintain glucose levels and support healthy skin and hair. Camu Camu: Chock full of Vitamin C (1180 % of your daily intake), Camu Camu will help you fight cold season for sure. It contains potassium which is great for joints and gallic acid which is considered to be an anti viral. Maca Root: Helps with General healthy, supplyin Iron which helps restore red blood cells. Great for increasing energy levels and performance functions. SO imagine all of this in a delcious shake that all you have to do is blend with ice and drink?